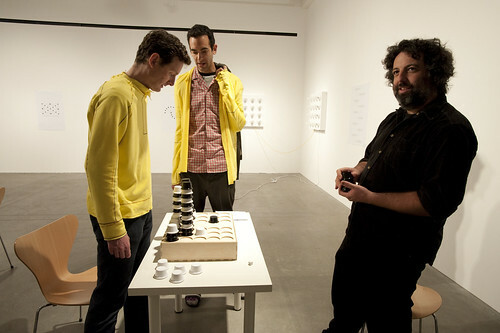 Here are some visuals and notes from the current UCLA DMA MFA Exhibition, 2009. Yiyun Kang (yiyunkang.com) “BETWEEN” video installation attempts to seek the sensory engagement of the audience with multiple projections & life-size screens. 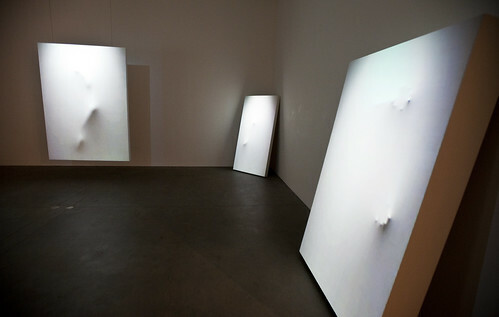 These were curiously dimensional projections that gave an eery sense that there was someone behind the panels. Nova Jiang’s work “Tethered Selves” and good-humored tracing of the wires and bits and controls (Criteria 13) to see how it all works. All in good fun. Lovely, melodic, unsettling sculpture. Nice work Nova. Nova Jiang work Alternate Endings, replications of what is worn. Recently seen at Milan during that Design Week. 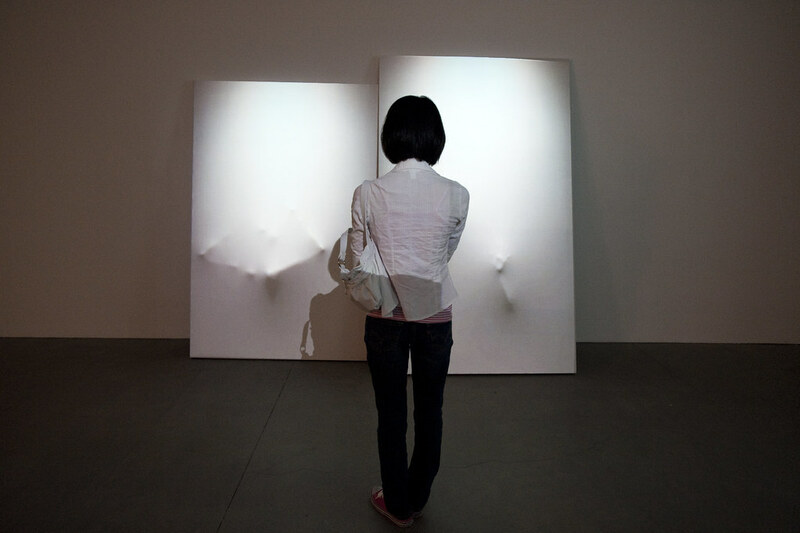 Nova Jiang “Tethered Selves” is a series of electro-mechanical sculptures exploring the implicit violence within the domestic sphere, presumably via the tiny dead flies that are stuck to the fly paper that lies on the perimeter of the wheel. 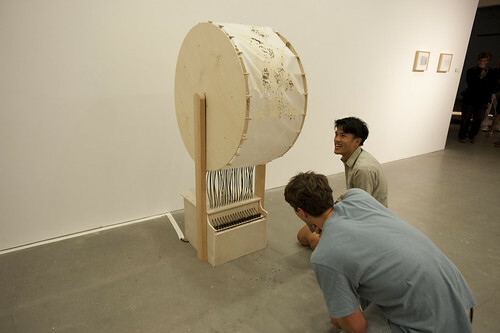 As the wheel rotates, a small player piano is plays a melody, with each dead fly serving as what would be the holes one finds on an old-fashioned player piano. Also Nova exhibited Alternate Endings, where fashion is made on location that replicates what one is wearing. This is intriguing as it adds a certain kind of craft-performance in the location. David Elliot, “All Fun and Games” is a collection of table games and play activities that embody social and political ideas. The project looks at the possibility of using ‘interactive analogies’ as a way of producing meaning through the act of playing and aims to facilitate a guided but individualistic interpretation of the games in the mind of each player. 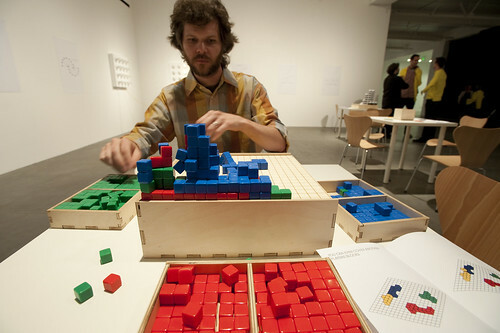 The interpretation is guided through a minimally suggestive aesthetic and semantics while at the same time retaining the possibility for unique interpretation through intentionally ambiguous interaction design. Why do I blog this? 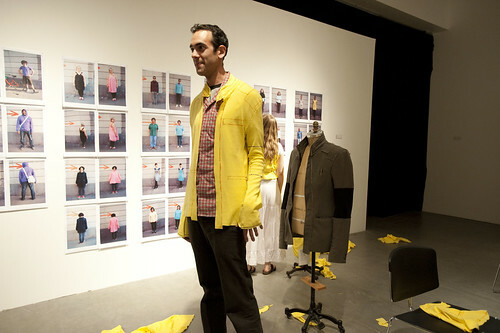 To capture some of the recent work of local design media graduate students. It is intriguing to me to see the evolution of the work within the field. It is impossible to say whether there is a certain trajectory, generally speaking, of course. What I saw was far less in the way of digital electronic stunts and so forth, and there were only two pieces which had people looking around to see how the thing worked, and even in those cases the pieces were still enjoyable. I wasn’t able to document everything, and there are five other participants in the show as well. The was a pleasant compactness and simplicity to the exhibiton and the pieces themselves, in their ambitions, were remarkably legible and appropriate to the modesty of these times, somehow. This is of course my own reflection after maybe two hours in the show, talking to people, wandering, meeting and discussing pieces, etc. I quite enjoyed that the work reined in the ambition to be expansive or didactic or overly burdened by instruments and sensors and enforced interactive scenarios, etc.